Clermont Garden Club has chosen Noland’s Roofing for December’s “Yard of the Month.” Noland’s Roofing is located at 1295 W. Highway 50, Clermont. A row of beautiful hibiscus bushes serve as a divider between the highway and Noland’s property. At the corner of the building, next to the entrance, you are greeted by a riot of color in the planting bed. There are mounds of periwinkle in shades of fuchsia, white, red, and pink around the base of two tall palms. Yard of the Month spotlights a garden of a different Clermont resident or business once a month from September – May to establish relationships with the community and increase awareness of Clermont Garden Club. 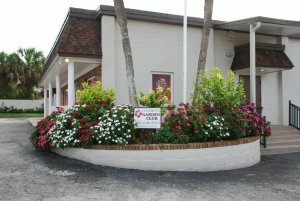 Clermont Garden Club meets every third Wednesday of the month, at the clubhouse, 849 West Avenue, Clermont, FL 34711. Meetings begin at 10:00 A.M. New members and guests are warmly welcomed.